The Trekker is our latest design of knife – we wanted to do something we had never done before and make a lightweight skeletonized knife that could be either worn as a simple neck carry or a backup to a large camp knife or parang. This is the smallest full tang knife we make to date with a cutting edge that is 2.25” with an overall length of 5.75”. We also wanted to use water jet cutting technology to its best advantage by cutting the panels out of the handle to make it even more lightweight, ergonomic and shapely than just removing the bulk by drilling out holes in the tang of the knife blade. This skeletonized handle gives you a few options, you can either keep the handle bare which allows you to keep it slim line and easy to bolt onto other sheaths, or it can be cord wrapped to make it more comfortable. 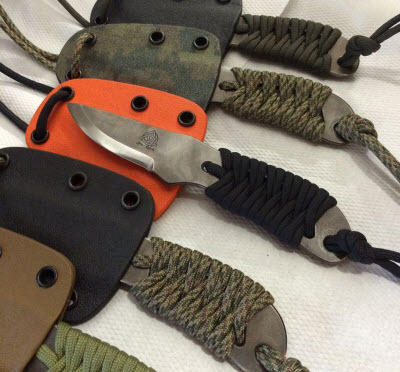 You can also make it into a great survival blade with the option of using paracord and wrapping some survival gear into the handle. We have different blade thicknesses and blade shapes available on this knife, a classic spear point, a clip point, a Tanto or a Wharncliffe in 2.5mm or 3.5mm. We also offer it either as a skeletonized blade, cord wrapped or with attached shaped handle scales in various materials and colours. The Trekker comes with a self locking, kydex neck carry sheath and a paracord neck loop. The overall package gives you a lightweight, compact utility or survival blade that has many carry options and is compatible with attaching to our other kydex sheaths.